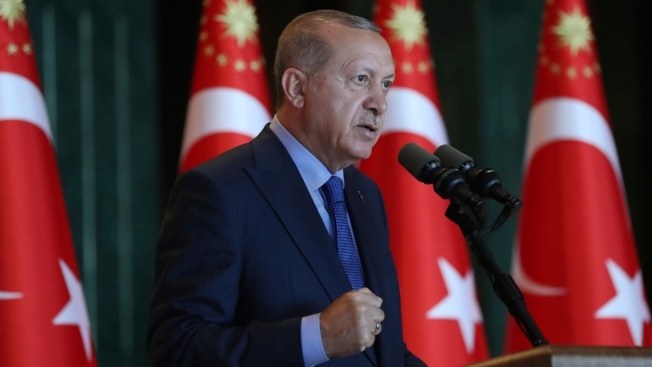 Turkey's President Recep Tayyip Erdogan, gestures as he delivers a speech to Turkish ambassadors at the Presidential Palace in Turkey, Monday, Aug. 13, 2018. Erdogan says his country is under an economic "siege" that has nothing to do with its economic indicators. He insisted that Turkey's economic dynamic remain strong and said the Turkish currency would soon settle "at the most reasonable level." Turkey's president appeared to escalate a dispute with the United States that has helped foment a Turkish currency crisis, claiming Tuesday that his country will boycott U.S.-made electronic goods. Behind the scenes, however, diplomats resumed contact to ease tensions.